Featuring 4K Ultra HD resolution and an immersive 20-point touch screen, the ViewSonic® ViewBoard® IFP6550 delivers incredible collaborative capabilities for 21st century boardrooms and classrooms. With astonishing 20-point simultaneous touch capabilities and pre-installed ViewSonic vBoard® annotation software, this 65” interactive flat panel lets multiple users write or draw on the screen with their fingers and styluses. With a built-in quad-core processor, as well as versatile connectivity options including multiple HDMI, VGA, RS232, RJ45, and USB ports, this display provides powerful computing for annotation and multimedia playback without the need for a PC. This display delivers optional slot-in PC capability, for more computing-intensive interactive applications. The IFP6550 features a VESA-compatible design and can be placed on a wall mount, or on an optional trolley cart for flexible installation in classrooms and corporate meeting rooms. With four-times the resolution of Full HD, ViewBoard®’s Ultra HD 3840 x 2160 display delivers breathtaking visuals. 4K DisplayPort input is also supported for external sources. Flicker-Free technology and a Blue Light Filter come standard to help to eliminate eye strain from extended viewing periods. ViewBoard® allows multiple users to annotate on the slim display simultaneously, increasing engagement and encouraging group collaboration. Two-finger touch activates ViewBoard’s Floating Pen that allows for easy annotation on everything from powerpoint files, to text docs, USB files, internal memory, or even on images from a connected input source. Equipped with a powerful quad-core processor and Android OS, this display provides smooth, lightning-fast computing and responsive touch capabilities. 16GB of onboard memory provides ample storage for files and multimedia content. Integrated with ViewSonic vBoard and Cast software, as well as Zoom® software, this display delivers out-of-the-box annotation and content sharing capabilities. This display can also be upgraded with Intel® Unite, which can wirelessly and securely display media from any range of devices such as tablets, laptops, and mobile phones. ViewBoard® Cast is a content sharing app for mobile devices that enables 1080p content to be streamed from a user’s device onto ViewBoard® wirelessly or over a cable network. Display quiz questions on ViewBoard® and allow participants to submit answers remotely. Whether deploying a single or multiple choices question, ViewBoard® will record statistic result for each device being used. Pop quizzes can be easily implemented by syncing up ViewBoard® with participants’ devices; once synced presenters can choose from multiple choice questions or the text to answer messaging function. Zoom is a conferencing app that enables content to be streamed from a user’s devices onto ViewBoard® over the internet. It supports up to 10 participants, allowing 4 of the 10 to stream content from their laptop or smart phone. vBoard is an annotation app used for writing and drawing on the ViewBoard®. The intuitive “draw with one finger, move/zoom with two fingers, and erase with three fingers” design delivers a user friendly experience. Tamashare is the first software that allows group collaboration in any kind of work organisation. 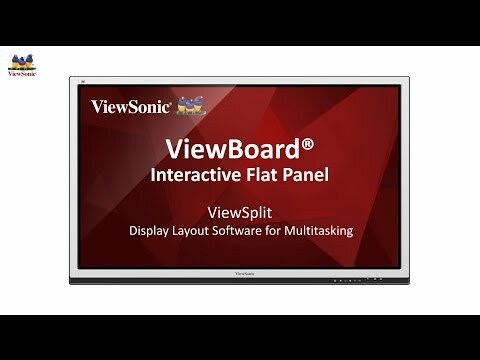 ViewBoard®’s vBoard, Cast, and Browser shortcuts enable users to write, cast content, and surf the web; 3 of the most commonly used functions during meetings and in class. These easy access desktop icons are displayed as soon as the ViewBoard® is powered on. Offering users a complete wireless environment, the optional slot-in wireless module provides a dual band 2.4GHz/5GHz WiFi network, as well as Bluetooth support for flexible usage. Mirroring capabilities deliver group discussion and spatial arrangement flexibility by allowing content to be mirrored on to two ViewBoard®s simultaneously. The 7H scratch-resistant and anti-glare screen offers a durable and consistent high-quality touch experience. HDMI, USB, and VGA connections provide the versatility to connect to a wide variety of computing and multimedia devices. The ViewSonic ViewBoard IFP6550 is a TCEA Best of Show Winning product. Backlight Life: 30,000 Hours Min.